Photo credit: Charles Fulton, CC BY 2.0. NICOLE: Happy Friday! What’s on your docket for the weekend? NICOLE: Hahahaha! I heard you had a lot of special events to attend. JUSTINE: Oh man. I know the month of April happened, because my credit card bill is proof of it, but it basically compressed into one giant mess of traveling and partying. A 30th birthday party for a friend in New Orleans, followed by three weddings, three Saturdays in a row (with two out-of-state!). NICOLE: Wow! How did you manage all of those expenses? Did you make a plan? Try to economize? Or just let things happen? JUSTINE: I definitely started budgeting for all of this at the end of last year by making a list of all the events, and ballparking what I thought they would cost. Some things, like flights and hotels, I was able to cover earlier in the year, so I wasn’t feeling the pinch quite so much in the moment. I also lucked out on the two destination weddings, because I was able to split costs with a bunch of people for our lodging. JUSTINE: But certain places are just EXPENSIVE. JUSTINE:I don’t think it’s possible to get out of New Orleans for under $100 a day. JUSTINE: Oh GOD, don’t even say such things. NICOLE: When you travel, do you try to do the thing where you don’t have to check a bag, don’t have to buy airport food, etc.? Or do you consider all of that part of the cost of the trip? JUSTINE: I have trust issues, so I pretty much refuse to check bags as a rule…? But I don’t mind buying airport snacks — that just rolls into the overall cost of the trip. NICOLE: Some airports have really good snacks, too! LAX has that fresh foods bar place, for example. JUSTINE: LAX has a great food scene. And DCA (my home base airport) has the only Cava that serves breakfast! It’s a game-changer. NICOLE: YES! DCA is pretty good for food. Although I am always tempted by the Dunkin’ Donuts. 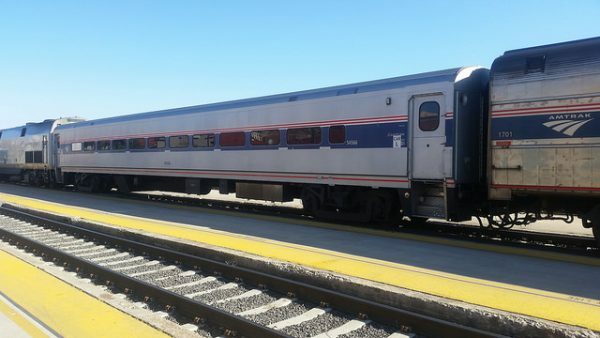 JUSTINE: Which is pretty much your only option in the Southwest terminal… It’s weird, but one of the things I’m most excited about for this weekend is the Amtrak ride. I never get to take the train, but I kind of love it? Something romantic about it. NICOLE: Oh, I love trains too. Amtrak is great, although their bathrooms seem to get filthier and filthier every year I ride the trains. But if I could do trains over planes I would, every time. JUSTINE: I’ve got this idea in my head that one day I’ll do one of those cross-country train rides, where you just commit to riding the rails for two or three weeks. I love the idea of it, but I worry the reality would have me booking the first flight out of like, Atlanta. NICOLE: I did that trip, if you count “cross-country” as north/south. Rode the Coast Starlight up the West Coast and loved it. Highly recommended. Also, only three days instead of three weeks, which is just the right amount of time. JUSTINE: I bet that was GORGEOUS. NICOLE: It was amazing. They had an observatory car. JUSTINE: Gah, sounds fantastic. Someday! JUSTINE: Don’t hesitate to take solo trips! I’ve had a blast the few weeks traipsing all over the country with my friends, but I am super excited to go to Richmond by myself, sleep in a king-sized bed, and not talk to anyone for two days. The fact that I bought the train tickets on sale and got the hotel room with points? Even better. Want to be part of a future Friday Chat? Email Nicole at nicole@thebillfold.com.